The crystal structure of sodium chloride, NaCl, a typical ionic compound. 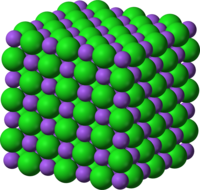 The purple spheres are sodium cations, Na+, and the green spheres are chloride anions, Cl−. In chemistry, an ionic compound is a compound made of ions. They have strong ionic bonds between particles. Lots of energy (heat) is required to break the bond apart, resulting in high melting and boiling points. The ions join together because they have different charges. Compounds of metals and non-metals are usually ionic. They are made when two or more atoms come close together and an electron goes from one atom to the other atom. The electron does this because both atoms want a full outer shell, similar to those of the noble gases. Note 1: carbon and silicon in Group 4 usually form covalent bonds by sharing electrons. Note 2: the elements in Group 0 do not react with other elements to form ions. This page was last changed on 12 February 2018, at 08:44.